Yesterday I was incredibly saddened to be notified (via Twitter) of the death of one of my favourite authors, Sir Terry Pratchett. Pratchett was a fantasy writer most famous for his Discworld series. In honour of his great work, rather than present an obituary I thought I'd have a fond look back at both a character and a concept that he covered extensively: death. a horse which is named "Binky". Throughout the series, death (or Death when referring to the character) is regularly mentioned. 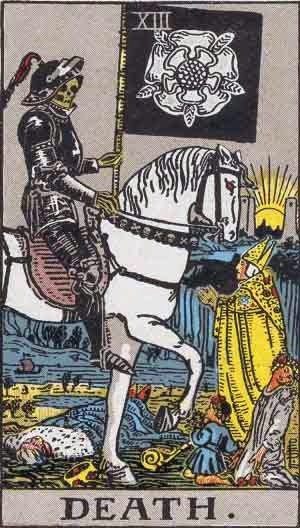 When personified, Death appears as a scythe-wielding skeleton in a robe. Aside from his love of cats and curries, his "voice" is one of the fascinating elements in the series. Despite the wonderful descriptions of Death, he is rarely perceived by humans as they unsurprisingly don't want to see him. While I've used the masculine pronoun to refer to Death, in the books his gender is somewhat ambiguous. While English doesn't have gendered nouns, certain languages, such as French, require it, meaning that international versions of the Discworld books featuring the character have come up with some inventive ways to deal with his/her/its gender. There is also a cultural issue when it comes to the representation of Death in Discworld. His appearance is based on a Western representation of death, which can make matters very confusing for cultures that have a different idea of Death's appearance. That’s mortals for you, Death continued. They’ve only got a few years in this world and they spend them all in making things complicated for themselves. "no-one is finally dead until the ripples they cause in the world die away"